Now that the new Saga numbers are showing up it would be mighty helpful to have a numbered list stickied to the top for reference purposes. Reasonable? Now for my next request can you please link all the figures to an image so I can decide what's crap and what's not? Actually, I'm working on linking Jared's hi res pics to my TSC checklist. Or just jump right to the Image Database. Does any one know where the HOF(ailrures) line up will fall into this schedule? Just for easy reference, I'm going throw this in here. Q. 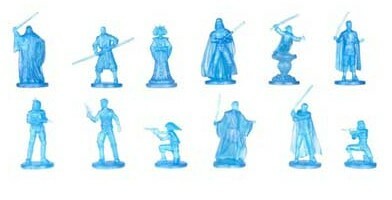 The Star Wars basic figures for 2006 come with a hologram figure – how many figures are there? Are they randomly-assigned?